3 3 P1 Karan, K., Gimeno, J., & Tandoc, E. (2009). Internet and social networking sites in election campaigns: Gabriela Women s Party in the Philippines wins the 2007 elections. Journal of Information, Technology and Politics. 6(3/4), doi: / Professional Article PP1 Thorson, E., Shoenberger, H., Tandoc, E., Fleming, K. (2011). Using consumer preferences to plan cell phone news products. Paper published by the Reynolds Journalism Institute. Conference Presentations C32 C31 C30 C29 C28 C27 C26 C25 C24 C23 C22 Tandoc, E. (2013). Web metrics as heuristics. How online news audiences prioritize economic and cultural capital when choosing which news stories to read. To be presented at the International Communication Association Conference. London. Tandoc, E. & Jenner, M. (2013). Analyzing web analytics. How newsrooms use web metrics in news construction and why. To be presented at the International Communication Association Conference. London. Tandoc, E. & Takahashi, B. (2013). The changing nature of environmental discourse: An exploratory comparison of environmental journalists and bloggers. To be presented at the International Communication Association Conference. London. (Top Faculty Paper) Tandoc, E. & Takahashi, B. (2012). Environmental crusaders or just playing by the rules? Role conceptions and role inconsistencies among environmental journalists. Paper presented at the National Communication Association Conference. Orlando. Tandoc, E. & Peters, J. (2012). Explicating the concept of journalist: How scholars, legal experts and the industry define who is and who isn t. Paper presented at the Association for Education in Journalism and Mass Communication (AEJMC) Conference. Chicago. (Top 2 Student Paper) Tandoc, E. & Ferrucci, P. (2012). Gates wide open: A systematic review of gatekeeping research. Presented at the AEJMC Conference. Chicago. (Top 4 Student Paper) Tandoc, E. & Shoenberger, H. (2012). What s on your mind? What Facebook users disclose in their status updates and why. Paper presented at the AEJMC Conference. Chicago. Tandoc, E. & Thorson, E. (2012). Talking or Thinking? Pathways from news to political learning among adolescents. Presented at the AEJMC Conference. Chicago. Tandoc, E. (2012). Displacing the displacement hypothesis: Does the internet really displace traditional media? Presented at the AEJMC Conference. Chicago. Ferrucci, P., Tandoc, E., & Maksl, A. (2012). The gates around the book: Applying gatekeeping theory to Facebook. Presented at the AEJMC Conference. Chicago. Ferrucci, P., Tandoc E., Hong, S., Almond, A., & Leshner, G. (2012). Game of colors: Implicit and explicit stereotypes in coverage of America s pastime. Presented at the AEJMC Conference. Chicago. 4 4 C21 C20 C19 C18 C17 C16 C15 C14 C13 C12 C11 C10 C9 C8 C7 C6 Hellmueller, L., Tandoc, E., & Vos, T. (2012). Beyond content: Framing through the roles of journalists. Presented at the AEJMC Conference. Chicago. Shoenberger, H. & Tandoc, E. (2012). Attention Please! Why Facebook use is not enough to make people buy from Facebook ads. Presented at the AEJMC Conference. Chicago. Ferrucci, P., Tandoc E., Painter, C., & Leshner, G. (2012). A black and white game: Racial stereotypes in baseball. Paper presented at the International Communication Association (ICA) annual conference, Phoenix, Arizona. Shoenberger, H. & Tandoc, E. (2012). Status Update: Understanding Facebook use through explicit and implicit measures of attitudes and motivations. Paper presented at the ICA conference, Phoenix, Arizona. Tandoc, E., Hellmueller, L. & Vos, T. (2012). Mind the Gap: Between journalistic role conception and role enactment. Paper presented at the ICA conference, Phoenix, Arizona. Tandoc, E. & Takahashi, B. (2012). The complex road to happiness: The influence of human development, a healthy environment and a free press. Paper presented at the ICA conference, Phoenix, Arizona. Tandoc, E. & Hong, S. (2012). A Glance at What Shapes Stance: The Interplay of Individual and Situational Factors in Deciding When to Accommodate and Who Should Deliver the Organization s Message. 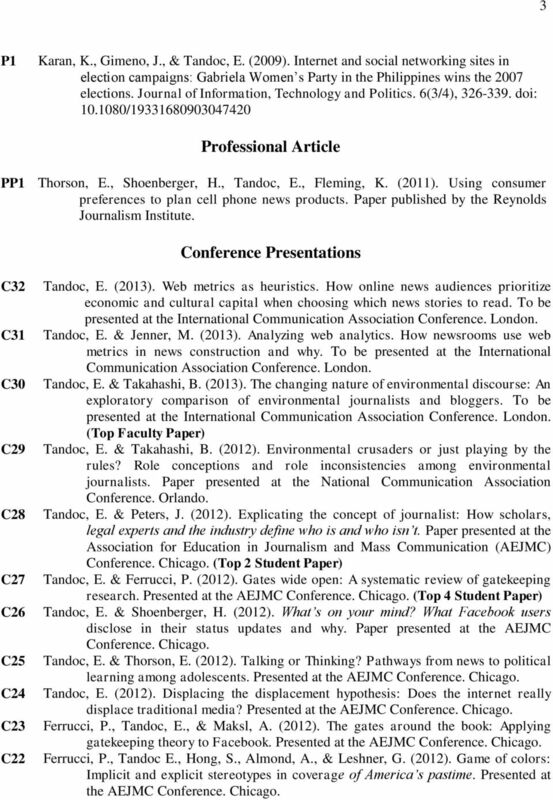 Paper presented at the 15 th International Public Relations Research Conference (IPRRC), Miami. Ferrucci, P., Tandoc, E. (2012). Look to the Stars: Gender and race in horoscopes. Paper presented at the GPC Research and Creative Activities annual conference, Columbia, Missouri. Tandoc, E. & Peters, J. (2012). 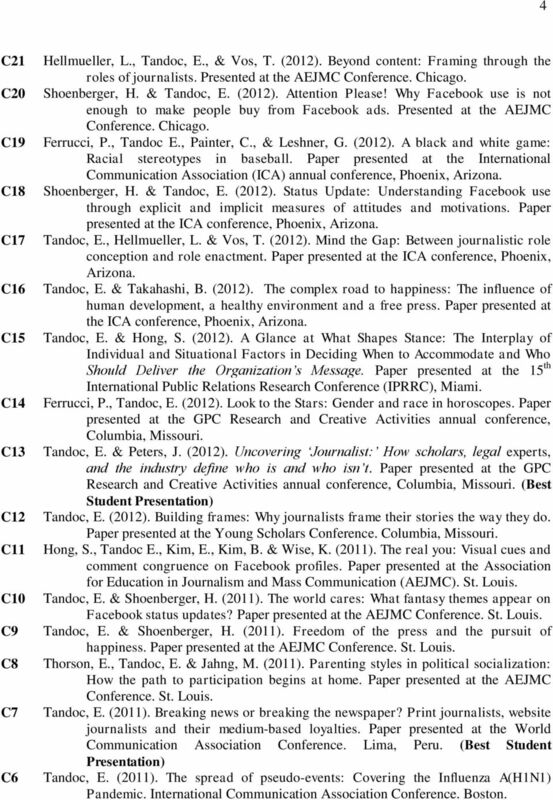 Uncovering Journalist: How scholars, legal experts, and the industry define who is and who isn t. Paper presented at the GPC Research and Creative Activities annual conference, Columbia, Missouri. (Best Student Presentation) Tandoc, E. (2012). Building frames: Why journalists frame their stories the way they do. Paper presented at the Young Scholars Conference. Columbia, Missouri. Hong, S., Tandoc E., Kim, E., Kim, B. & Wise, K. (2011). The real you: Visual cues and comment congruence on Facebook profiles. Paper presented at the Association for Education in Journalism and Mass Communication (AEJMC). St. Louis. Tandoc, E. & Shoenberger, H. (2011). The world cares: What fantasy themes appear on Facebook status updates? Paper presented at the AEJMC Conference. St. Louis. Tandoc, E. & Shoenberger, H. (2011). Freedom of the press and the pursuit of happiness. Paper presented at the AEJMC Conference. St. Louis. Thorson, E., Tandoc, E. & Jahng, M. (2011). Parenting styles in political socialization: How the path to participation begins at home. Paper presented at the AEJMC Conference. St. Louis. Tandoc, E. (2011). Breaking news or breaking the newspaper? Print journalists, website journalists and their medium-based loyalties. Paper presented at the World Communication Association Conference. Lima, Peru. 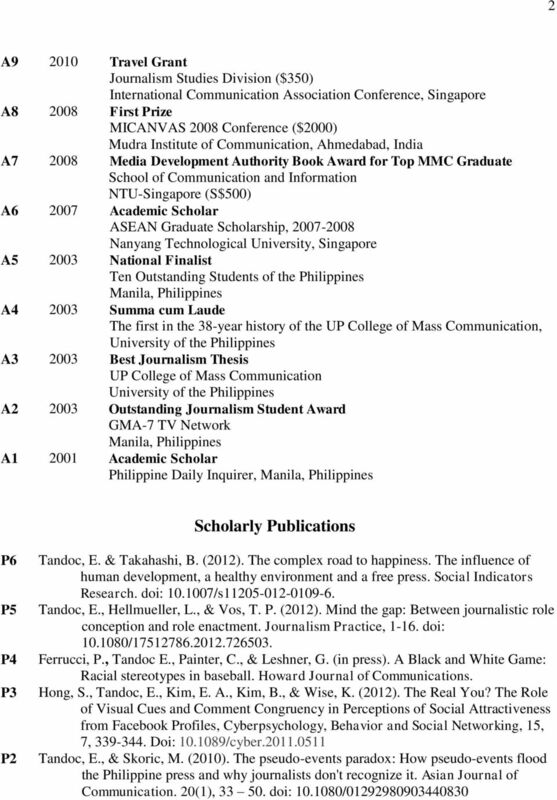 (Best Student Presentation) Tandoc, E. (2011). The spread of pseudo-events: Covering the Influenza A(H1N1) Pandemic. International Communication Association Conference. Boston. Heather Shoenberger Assistant Professor of Advertising School of Journalism and Communication University of Oregon Eugene, OR 97403 Phone: 845.820.1181 Email: hshoenbe@uoregon.edu EDUCATION 2014 Ph.D.
JEESUN KIM. Assistant Professor Department of Communications California State University, Fullerton Phone: 657-278-4729 E-mail: jeekim@fullerton. ALYSSA APPELMAN. Hettinga, K. E. & Appelman, A. (2014). Corrections of newspaper errors have little impact. Newspaper Research Journal, 35(1), 51-63. Dr. Kedron Bardwell. Department of Political Science Simpson College 701 North C St. Indianola, IA 50125 (515) 961-1593 kedron.bardwell@simpson. LAMAR L. JOHNSON 400E McGuffey Hall Department of Teacher Education Miami University Oxford, OH 45056 Phone: 803-480-3991 Email: johns700@miamioh. Re: Request for Endorsement as Candidate for APA President. My career has focused on education, training and mentoring. Potter, W. J. (2013). Media literacy (7th ed.). Thousand Oaks, CA: Sage Publications. (Wrote/edited all ancillary materials to accompany book. Gottlieb CV, 1 of 5 JESSICA GOTTLIEB Department of Political Science Encina Hall West, Room 100 Stanford, CA 94305-6044 (818) 404-8298 (cell) jgott@stanford.edu; www.stanford.edu/~jgott EDUCATION Ph.D. Respond to all four questions, following the Degree Program Assessment Plan Form Instructions. Attach additional pages as needed. TEXAS STATE VITA Please note: For all entries, list most recent items first. Headings without entries may be eliminated, but the heading lettering/numbering should remain consistent with this template. 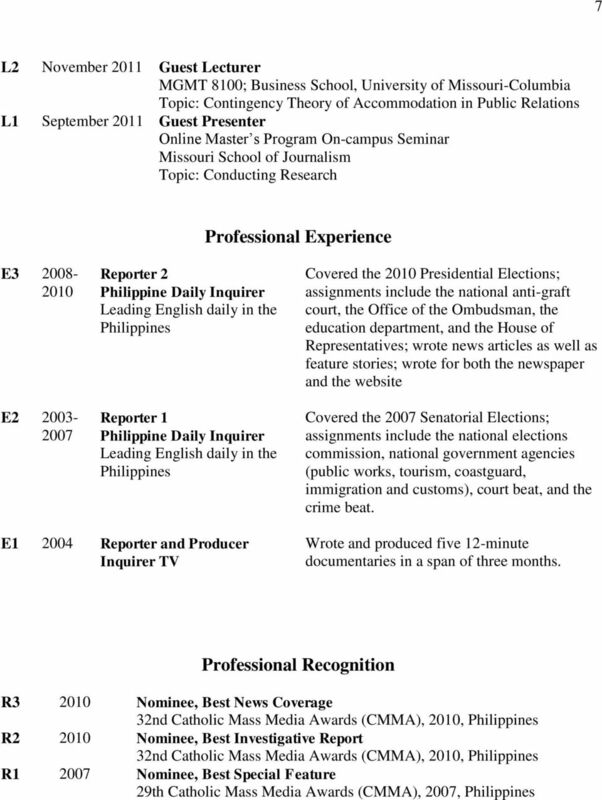 ANDREW LECKEY Curriculum Vitae EDUCATION Graduate Fellowships: Fellow, The Media Studies Center, Columbia University Graduate School of Journalism. Research on financial trends in online journalism, 1994-95. PHILIP J. PETTIS Department of Sociology Vanderbilt University PB 351811 Nashville, TN 37235-1811 615.322.7626 philip.j.pettis@vanderbilt. DEBORAH JORDAN BROOKS Dartmouth College Department of Government 6108 Silsby Hall, Hanover, NH 03755 603-646-3919 deborah.brooks@dartmouth. 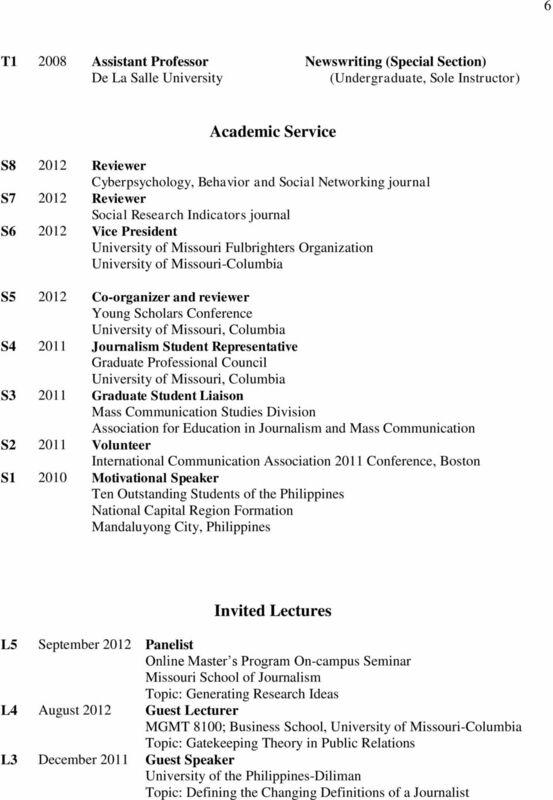 CURRICULUM VITAE. 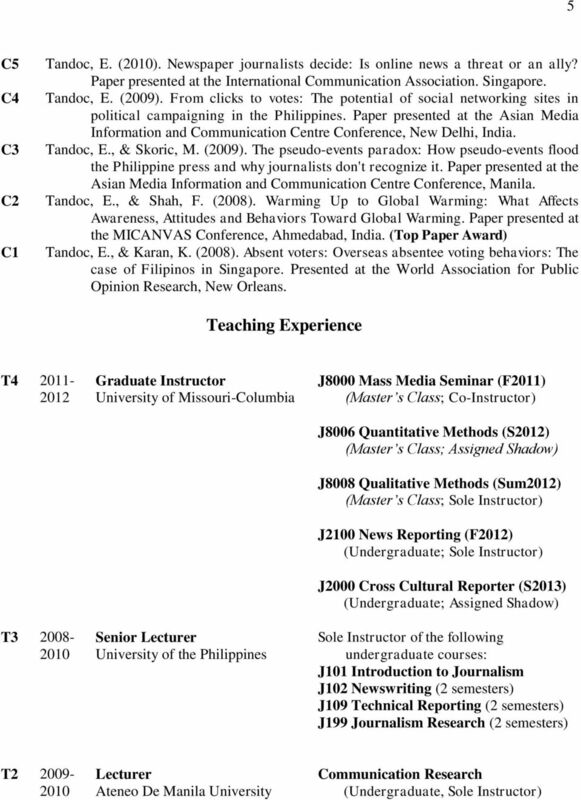 2015, University of Wisconsin-Madison, Mass Communications, Minor in Southeast Asian Studies Advisor: Dietram A.
Heather Akin Post-Doctoral Fellow Annenberg Public Policy Center University of Pennsylvania 202 S 36 th Street Philadelphia, PA 19104 Phone: (608) 358-6114 Email: hakin@asc.upenn.edu EDUCATION Ph.D. M.S. Tambra O. Jackson. M.Ed.- Curriculum and Instruction. Indiana Wesleyan University, Fort Wayne, Indiana. December 1998. Emine Fidan Elcioglu Department of Sociology University of California, Berkeley 410 Barrows Hall, Berkeley, CA 94720 fidan@berkeley. 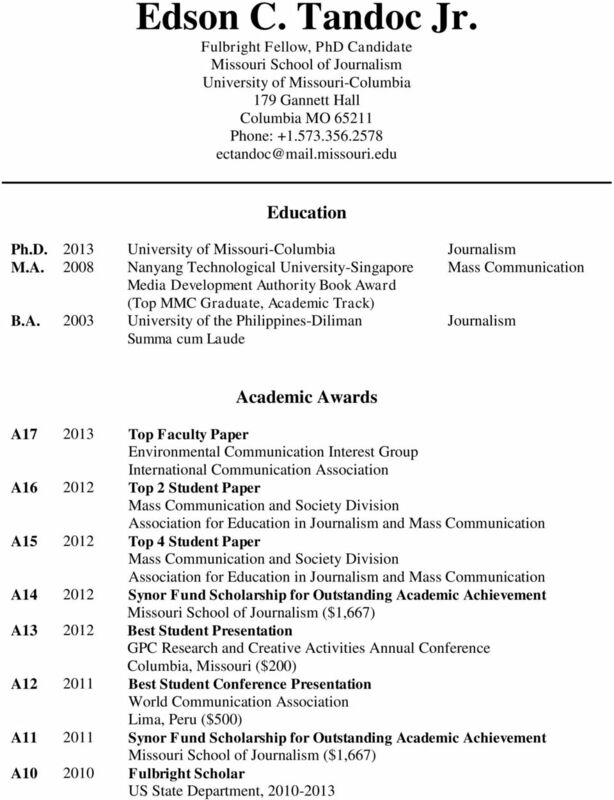 Curriculum Vitae Erit Maor (949) 981-4356 The City University of New York, The Graduate Center 365 5 th Avenue, 6 th Floor New York, NY 10016 eritmaor@gmail.com Education Ph.D. M.U.R.P. Certificate B.A.